Damo Suzuki, former lead vocalist for the massively influential krautrock band Can, has famously retired from studio recording. However, he continues to perform live concerts made up solely of compositions improvised entirely on the spot. These bold and fearless performances have enthralled audiences around the globe and brought new found attention to Suzuki’s incredible talent. Purple Pyramid Records is proud to present a new chapter in Suzuki’s ongoing musical explorations, a stunning collaboration with a German quartet of Can neophytes, going by the very Can-esque name of Jelly Planet. After performing live with Damo, the band was able to coax the singer into their studio for a fully improvised full length recording. Unlike previous Suzuki recordings, the studio setting gave the performers full control over every aspect of the recording ensuring that every nuance, inflection, and dynamic could be heard. The result is an album of incredible sonic quality and an authentically mind-blowing exploration into the outer edges of space rock! 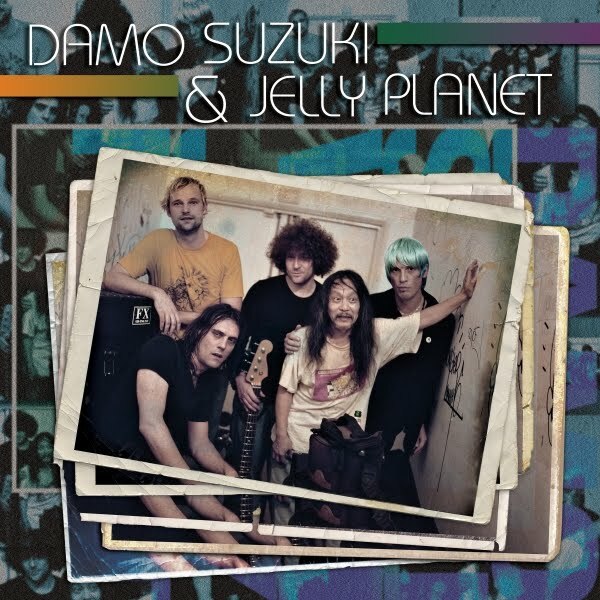 The self-titled album, Damo Suzuki & Jelly Planet, will be available on CD, vinyl (as a double LP set) and in digital formats starting February 2. Although he has been involved with numerous projects over the course of his lengthy career, Damo Suzuki (whose real name is Kenji Suzuki) remains primarily known as the lead singer for the German experimental band Can from 1970 to 1973. The band’s impact has grown considerably over the years which is interesting because when Can was in existence they were relatively obscure in the big scheme of things. Damo has retired from the world of studio recording, but he continues to play live concerts. As such, this is an important release because–after playing live with Suzuki–the guys in the band Jelly Planet were able to entice him into a studio to record these two lengthy tracks. These completely spontaneous recordings are interesting and intriguing on a variety of levels. Suzuki’s vocal work is miraculous in many ways. Unlike some who sound like they’re making stuff up on the spot, his unintelligible improvised vocal work sounds very much like it was created in advance and rehearsed (?!!). The man has an incredible knack for making the abstract seem very concrete and real. Jelly Planet provides the perfect foundation for Damo’s vocal stylings. The band is comprised of Felix A. Gutierrez on bass, Stephan Hendricks on keyboards, Jens Kuchenthal on drums, and Alexander Schonert on guitar. Recorded by Guido Lucas at Blubox Studio in Germany in 2005, these tracks are bound to please Can fans and just about anyone who loves cool and credible improvisational music. A wild ride from start to finish.